Yesterday the south wind cranked through San Diego at close to 2o miles per hour. It blew from 8am until at least five o'clock. Cranking. There was surf in the water but the wind was just tearing it to pieces. I ended up kite surfing most of the day on my 12m kite- which is great for windless San Diego. Nobody should've been out paddling in those nasty conditions but evidently the annual YMCA 20 mile Bay-to-Bay Race was underway. Chris Koerner from Dana Point told me that there were at least six rescues as well as overhead sneaker sets, sharks, nasty boat chop and that in-your-face, peel-back-your-eyelids south wind to contend with for the entire race. It wasn't a race it was a siege. I am amazed that anybody even finished the the thing and I heard a few tales of contestants car topping the gear after doing quick wind checks out of Mission Bay. Chris completed it on a stand up board in five and a half hours- which is a ridiculous amount of time to be on the water. I guess the central question I have for Chris would be: What the #$%# where you thinking! I'm working on Chris to provide some more details- I think you might be interested to. Photo: While the cat's away the sand bars will... FIRE! Even though I scored all kinds of fun waves today at Dog Patch it still hurts to come home, cruise up to the end of the street and see what, evidently, was firing all day long. Today was a totally different day. It turned out to be a classic California surf day; glassy, warm and sunny with really fun, combo-swell peaks lighting up the beaches and reefs all over San Diego. I fired up to meet a bunch of friends at Dog Patch in San Onofre. Allen and Jamie Cheateaux were pulling together a crew to celebrate the beginning of their round-the-world adventure. Tim Stamps and Cowboy were coming down to log some San-O time on Stamps' high performance 9'0 Stand Up Board. Big Chuck Patterson was out smacking stupid anything that crossed paths with him and his Hobie stand up (which looked pretty darn thin and very foiled out). EJ and Andie even staked out some beach real estate for the day. I ended up spending about eight hours at the 'Patch and got in three different sessions- trunking it the whole time. Hope you got some surf too! Bro I want to cruise to the patch with you one of these times. Never been, but sounds like fun. 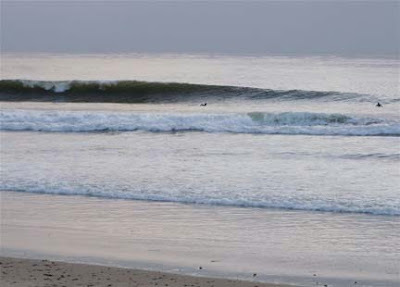 we were surfing on Saturday at OB with Olivier, Danny, Corky and Brian. we talked to a few guys who were doing the race. It was nuts. so windy. But the surf was good, really good. we were in the water for a couple hours. 2 of the guys were doing the race paddled by us and were catching waves on their way south. They were not in a hurry but were having fun. Yep Junkie- sharks. Or if you prefer, in espanol, echarks. Yo- Tex, read the last post I put up. That must've been you guys talking to my buddy Chris- who seems to verify your claim of good surf- damn, I should've charged it up there instead of kiting with a bunch of Donkeys at the strand. This summer big Chad- you drive and I'll bring the beer... and low pro Big Gulp cups.